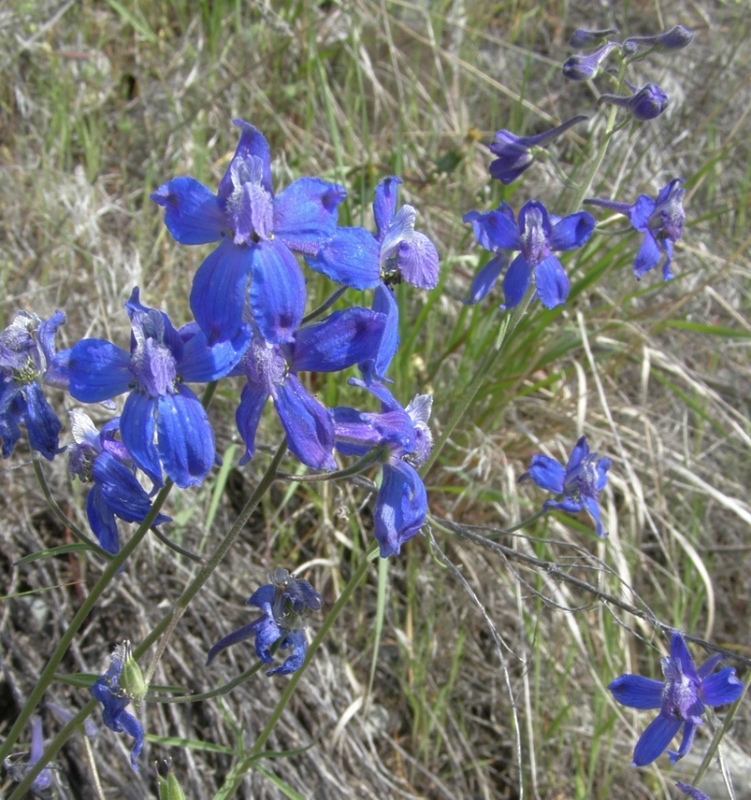 Low Larkspur growing on grassy dry sidehills along the Chilcotin River at Farwell Canyon, near Riske Creek, B.C., May 13, 2010. Note contrasting violet veining on the cobalt blue petals. Perennial. Zone 2. Ranunculaceae. Western North America, from California north to southern third of British Columbia, and eastwards to southern Sakatchewan, South Dakota and Wyoming. Abundant in areas of the eastern Rocky Mountain foothills. A widely variable species, from alpine forms only a few inches tall to grassland individuals reaching 18″ or taller, D. bicolor is now sometimes classified as D. nuttallianum, with regional subspecies. This low-growing spring-blooming flower is frequently found on the dry hillsides and grasslands of the Cariboo-Chilcotin, especially along the Fraser River corridor in the dryland fir and sagebrush belt. Though a close relative of the tall garden delphiniums and larkspurs, as flower form and colour show, this is a much more petite thing, growing from 6″ to 18″ or so in height, and blooming briefly in April and May. …A small but showy species, inhabiting Bunch-grass and Ponderosa Pine country from Osoyoos to the Rockies. At Macalister, just south of Quesnel on the Fraser River, we are at the northern limit of its grassland range, though variant populations have been reported in subalpine regions northwest of Prince George. 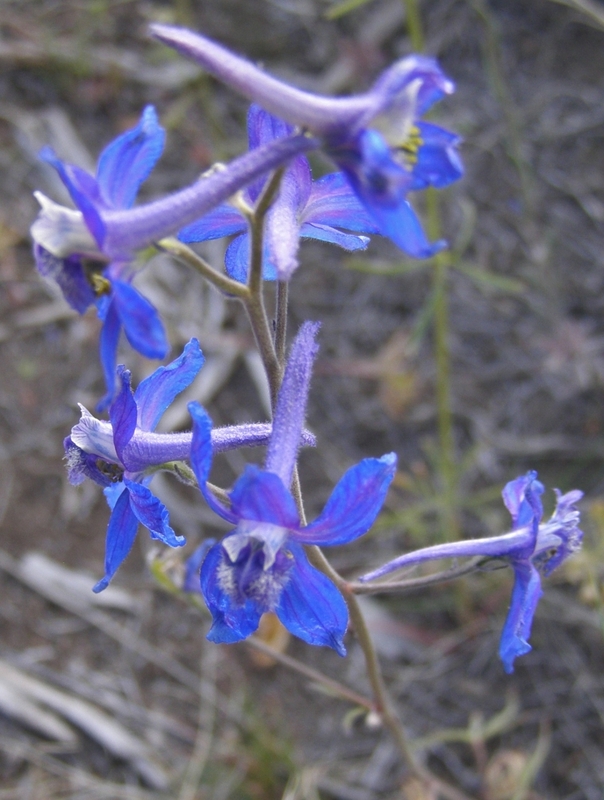 Low Larkspur is a tuberous rooted plant, which frequently behaves like a summer ephemeral. 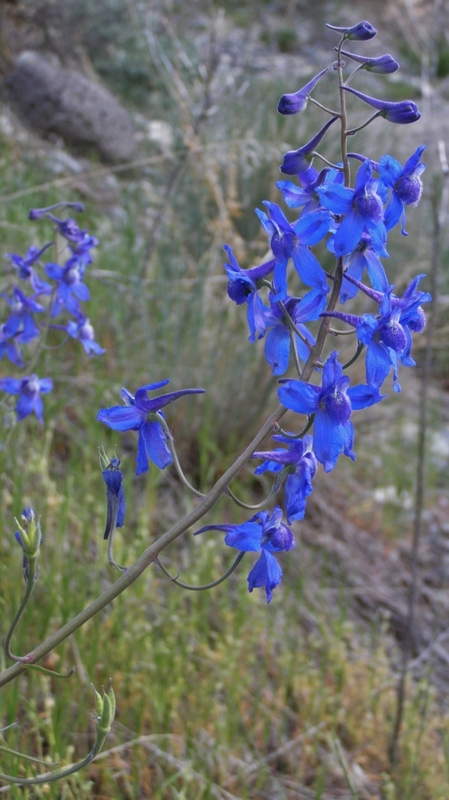 Slender bloom stalks appear in earliest spring, the flowers expand and are pollinated by butterflies and long-proboscissed bumblebees, and the finely divided foliage then withers on the stems, with the plant fading away into the surrounding vegetation, leaving clusters of innocuous yellow seed capsules in place of the cobalt and purple-blue blossoms. On our own dry and rocky Fraser River hillside, this lovely larkspur blooms in early May alongside golden Arnica, creamy Heuchera cylindrica, sulphur-yellow Lithopspermum ruderale, and rosy-flowered Geum triflorum – a rewarding palette of contrasting wild colour for the springtime rambler to enjoy. Despite its great beauty there is a sinister side to this gorgeous flower. In its spring growth phase, D. bicolor (and, incidentally, all of its relatives) is highly toxic to cattle. 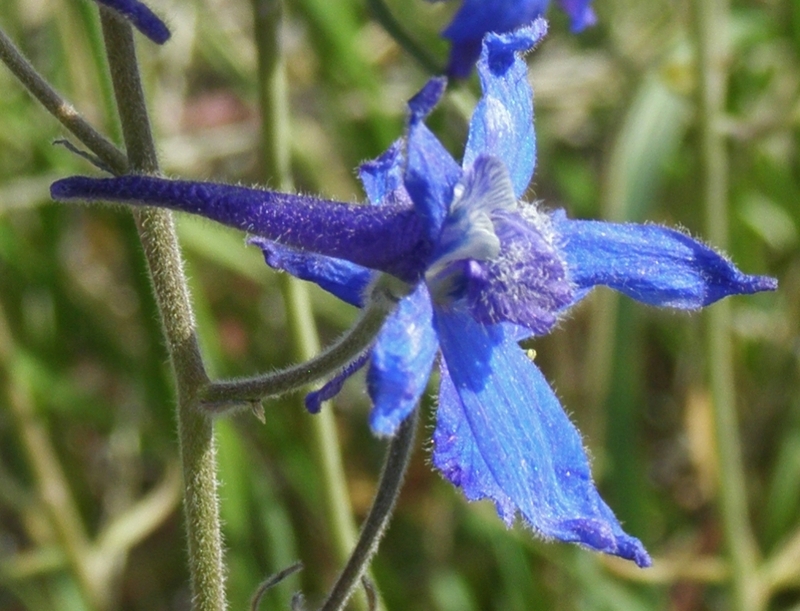 Because its foliage turns green before many of the rangeland grasses, browsing cattle sometimes seek it out, and there are numerous well-documented cases of mass bovine fatalities in regions where wild larkspur is abundant. By seed stage the toxicity has greatly abated; in our region this generally coincides with range turnout, and I am not personally familiar with toxicity episodes in the Cariboo-Chilcotin, though when I was working on a ranch in the Alberta foothills it was a very real concern for local cattlemen during spring turnout. 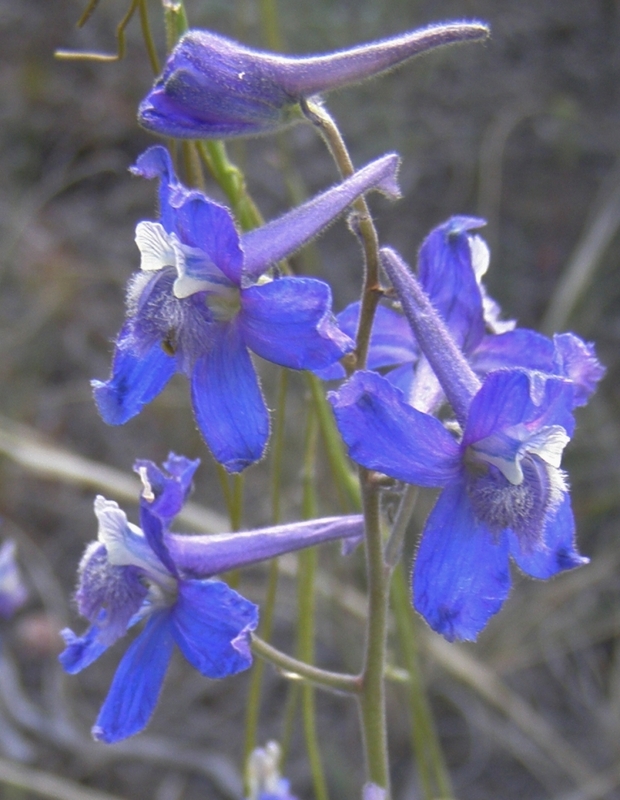 Interestingly enough, the toxic effect seems specific only to cattle; sheep and wild browsers appear to be unaffected, and sheep have been used to eliminate the plant in some areas where bovine larkspur poisonings are of particular concern. Low Larkspur moves happily into the cultivated garden, but with its delicate habit and summer dormancy it is best planted in an alpine bed, or among grasses, where conditions mimic those found in its natural habitat. I do not generally condone transplanting of wildflowers into the garden, but the collection of a modest quantity of mature seed in midsummer – being sure to scatter some about; never collect the entire contents of a plant’s seed capsules – should in no way impact our local populations. Sow immediately, preferably in a nursery bed, and look for seedlings the following spring, as many of the Ranunculaceae family (of which D. bicolor is a member) require a winter stratification period to trigger germination. Sun; average conditions; tolerates summer drought. This and following photos were all taken in the same area of the Chilcotin, at Farwell Canyon. Note the variability of the flowers even within this small population. May 13, 2010. Hooked spurs and contrasting “bee” petals are nicely portrayed here. Some individuals are also intricately veined with bright violet – as in the first photo at the top of this post – which is the inspiration of the species name, “bicolor”. The entire plant is finely pubescent, with the central “bees” being prominently hairy. Note the long spurs, which are often hooked. The nectary is so deep and narrow that only certain insects – most notable butterflies and native bumblebees – are able to access the nectar.